Marian (Taylor) Allen remembers riding to the still in the back seat of her father’s old "T Model" Ford when she was a young girl. Evans Bacon, a Geneva volunteer fireman, remembers fighting a woods fire in the area and discovering the old tar pit that contained residue from the distilling process. The distilled turpentine was shipped by river to Commodore Point at Jacksonville until 1913. The location where the turpentine barrels were loaded on steamboats has not been positively identified. However, Mr. Eddie Banks, whose father worked with the turpentine industry in Geneva, and others, have said that it was not shipped from the Geneva Dock but from a landing farther south near the head of Lake Harney. An 1884 table of steamboat landings on the St. Johns River shows another landing on the river four miles south of the Geneva Dock. This steamboat landing in the table was called "Sallies Camp". Bobbie Jo Braddy remembers that there was another landing; however, she did not remember what it was called at the time. She remembers the dock being in a slough near the end of the present Prevatt Road. Looking at a map showing the river channel, there is such a slough near the end of Prevatt Road and just off the main river channel. Mrs. Braddy also recalled that many local fishermen used the landing and she attended fish fry’s there. "Sallies Camp" is most likely the steamboat landing where turpentine was loaded. After 1913, turpentine was shipped on the Florida East Coast Railway. The barrels of turpentine were loaded on trains at Kolokee, a trainstop on the F.E.C. Railway between County Road 426 and the Econlockhatchee River. During this time the turpentine company had 27 mules and horses, three 4-mule teams, two 2-mule teams and one1-mule wagon to pick up the cups. The business was discontinued in 1927. The Kolokee Hiking Trail now passes through the spot where the Kolokee Station was located. Approximately one-half mile south of where the F.E.C. Railway crossed County Road 426, there is a small road that led to Kolokee. The road is now in the Little Big Econ State Forest, is clearly visible, and is being used as part of the horseback riding trail. Evidence of the turpentine industry’s existence can still be seen on a few scattered pine trees left standing in the Geneva area. These trees are scarred from the chipper’s tool that was used to allow the sap to flow from the trees. 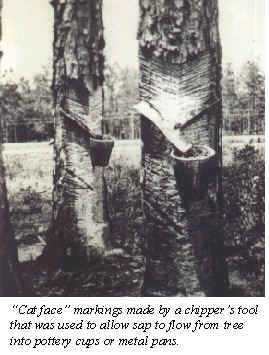 The marking was often called a "cat face". The tree bark has now grown around the scar on the trees left standing. After the turpentine industry left the area, the timber industry cut down most of the turpentine trees. Those trees left standing were likely too small to be of use. This is evidenced by the fact that the scarring is only on one side of the tree and larger trees were always chipped on two sides. 1 In the book Treasures Of The Longleaf Pines Naval Stores, by Carroll Butler, 1998, mention was made that the Council Tool Company of Council, North Carolina, (and later Lake Waccamaw, NC) was one of the companies that made and sold tools for the turpentine industry. John Pickett Council started the company in 1886. The compiler of this writing located the Council Tool Company on the Internet, contacted the company in late January 2002 and inquired if there was a connection to Arthur and James Council who started the turpentine industry in Geneva. In the interim, the Council Family genealogy was located on the LDS website and found that John Pickett Council was the youngest of 13 children of Kinchin Kitchen Council and Catherine Ann Sykes. James and Arthur were two of John’s older brothers. A few days later I had a call from Mr. Jack Council who said that John Pickett Council was his Grandfather and Arthur and James were his great uncles. We held a lengthy discussion about the Council family and their involvement in and contribution to the turpentine industry. I gave Jack Council the name and author of the book and he said that Carroll Butler had spoken with him a few years ago. It was suggested to Jack that he might want to locate a copy of the book since it contains many references to the Council Tool Company. 2According to Carroll Butler, author of Treasures of the Longleaf Pines, Navel Stores, the last remaining turpentine still in the entire United States in1998 was located in Baxley, GA. In Feb 2002, I contacted the town of Baxley via their web site and inquired about photographing the still. I was informed that the final product from the plant was in Dec 2000 and that the still is now being dismantled and there is nothing of historic value to photograph. This signifies the end of a long and significant part of Southern history. Geneva Historical & Genealogical Society, Historical Committee. "The Turpentine Industry". Orange County Tax Rolls. 1900-1912. Seminole County Tax Rolls. 1913. Treasures Of the Longleaf Pines Naval Stores. Carroll Butler. Tarkel Publishing. Shalimar,FL. 1998. Return to Geneva History page. Home Page Genealogy The Society Museum Books, T-Shirts, etc.